Let’s hope for a sunny day! Join Decatur Active Living on Saturday, May 5 from 10am until 1pm for the annual Touch-a-Truck Event. This fun community event gives children of all ages an opportunity to touch, explore and see their favorite trucks or equipment on wheels. The City of Decatur and DeKalb County dump trucks, fire trucks, tractors, police cars and motorcycles and many other types of vehicles will be on display. This year we will even have a solar panel display truck! Touch-a-Truck takes place in the East Lake MARTA station NORTH parking lot on DeKalb Avenue. Parking is limited so consider riding the train, walking or biking to the event. For more information, contact Cheryl Burnette 678-553-6541 or cheryl.burnette@decaturga.com. Be sure to visit www.beactivedecatur.com for up-to-date information on all Active Living programs throughout the year. This year’s event is sponsored by the City of Decatur, MARTA and Chick-Fil-A Decatur. Join members of the Pedestrian Advisory Committee for the Third Sunday Stroll which will be held this Sunday, September 17 at 2 pm. This month’s walk will explore Woodland Gardens. Larn about the plants as you tour and enjoy some time in nature. Meet at Westchester School and be ready to walk at 2 pm. For more information on walking in Decatur click here. This month’s stroll will be on Sunday, March 19 at 2pm. Meet in front of the Decatur Recreation Center for a stroll through downtown with members of the Pedestrian Advisory Committee. Discover Decatur at night with a walk through the City. Walkers receive a free light to wear and keep to “Be Safe and Be Seen”. Meet in front of Decatur Recreation Center at 7:30 pm. Join Sara, our Adult Program Supervisor, for thees weekly walks. Meet in front of the Decatur Recreation Center at 10 am. Walks average 3 miles and travel through various parts of the City. These walks have moved to the second Saturday of the month and leave the Decatur Recreation Center at 10 am. Next walk is April 8. For more information on walking in Decatur, visit http://www.decaturga.com/walking. Add a serving of vegetables to your lunch and dinner. Vegetables are rich in vitamins, minerals, fiber, and other nutrients that can reduce risk for some diseases. Replace saturated fats with heart-healthy fats. Cook foods in olive oil instead of butter, swap meat for fish, and stick with low-fat dairy foods. Go meatless one day a week and try some vegetarian protein sources such as beans, eggs, and tofu. Eating less meat is good for your health and the environment! Make at least half your grains whole, choosing whole wheat bread, unprocessed oats, whole wheat pasta, brown rice, and even ancient grains whenever possible. Whole grains are high in fiber, which helps keep us full, aids in digestion, and even fends off heart disease. Over the course of the month we’ll be sharing more nutrition tips like these to help you put your best fork forward! It’s Walk-tober : Come Walk With Us! There are lots of opportunities to walk with Decatur Active Living this month! Walk With a Doc is held every Wednesday at 9 a.m. Meet us in front of the Decatur Recreation Center for a three mile walk. Sometimes we have a Doc and sometimes we don’t – we always walk! If it is raining, we can walk the elevated track in the gym. Third Sunday Walk is October 16th at 1:30 p.m. and features Mayor Patti Garrett taking us on her 10,000 steps walk that is featured in a Visitor’s Center brochure. . Meet in Harmony Park and be sure to bring a water bottle. Fourth Thursday Bright at Night Walk will be held on Thursday, October 27 at 7:30 p.m. and is a Halloween themed walk! Walk by homes decorated for the holiday as you meet new friends and get your walk on. The walk lasts approximately one hour. Be sure to wear something bright so you will “Be Safe and Be Seen.” Walkers will receive a special light to wear and keep. Feel free to dress in costume! Let’s have some fun. Learn about Pedestrian Safety at the Concerts on the Square! The Pedestrian Advisory Committee of the Active Living Board will be at the Saturday Concerts on the Square all month to provide tips on being “safe at night”. Visit the orange Active Living tent for ideas, information and more! We encourage you to walk or bike to the Concerts and be sure to wear something bright and/or reflective. For more information on pedestrians visit decaturga.com/walking. Night time is a great time to walk! Join members of the Active Living Pedestrian Committee for this monthly “Bright at Night” walk. Walkers are encouraged to wear bright colors or reflective clothing so you can “Be safe and Be seen!” Participants will also receive a small light to wear and keep. Meet in front of the Decatur Recreation Center and be ready to walk at 7:30 p.m. Walks are around 3 miles and wind through Decatur neighborhoods. More information on walking can be found at decaturga.com/walking or contact Cheryl.Burnette@decaturga.com. Spring has sprung and provides great weather for walking! Join members of the Pedestrian Advisory Board for an evening “Bright at Night” walk. 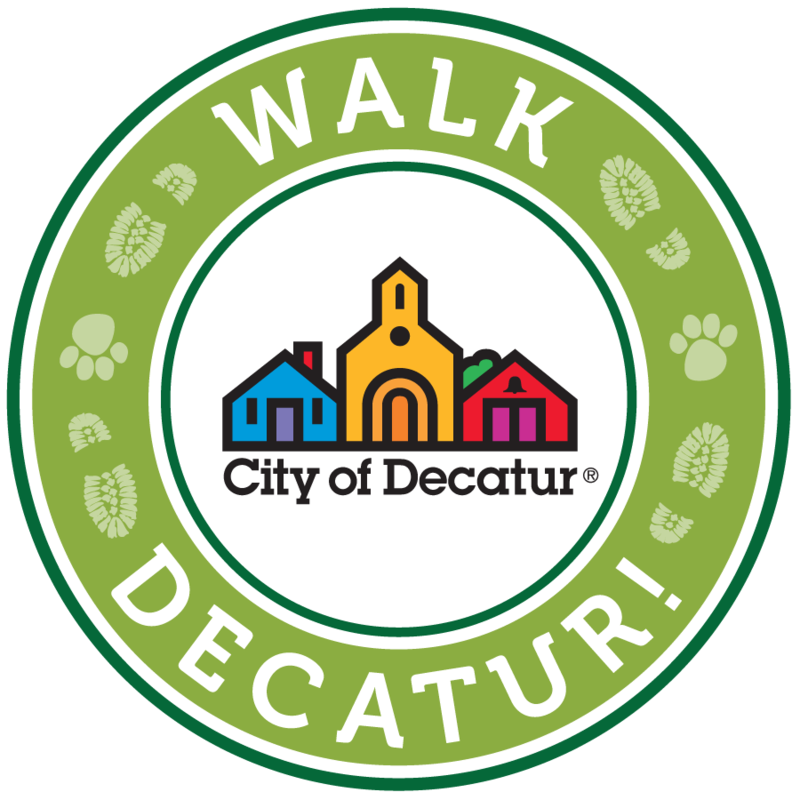 The walk will be approximately three miles and wander through Decatur neighborhoods. Walk Decatur Invites You to Walk! Third Sunday Stroll is April 17 at 2 p.m Learn about bees! Join beekeeper and Decatur resident Stavros Garoufalidis on our next Sunday Stroll, April 17th at 2 p.m. We’ll begin at the Decatur Recreation Center, and then walk through Agnes Scott, the PATH trail, and into the Winnona Park neighborhood, and back to the Recreation center, noticing bee hives and activity along the way. Bring your bee questions! Fourth Thursday “Bright at Night” Walk is April 28 at 7:30 p.m.
Meet in front of the Decatur Recreation Center for a brisk “Bright at Night” walk with members of the Pedestrian Committee. The walk begins at 7:30 p.m. Walkers will receive a free light to wear and keep. Wear something bright or reflective to be seen! Sunday Strolls and Bright at Night walks are organized by the Pedestrian Committee of the Active Living Board. They do a great job volunteering their time and energy. FREE to the community. For more about walking in Decatur, click here.